Extensive lymph node (LN) involvement portends significant risk for distant metastasis (DM) among breast cancer patients. As a result, local management may be of secondary import to systemic control in this population. We analyzed patients with ≥10 involved LNs (N3) to evaluate the feasibility of breast conserving therapy (BCT) vs modified radical mastectomy (MRM) in this high-risk cohort. Among 98 women with N3 disease 46 (46.9 %) underwent BCT and 52 (53.1 %) received MRM. 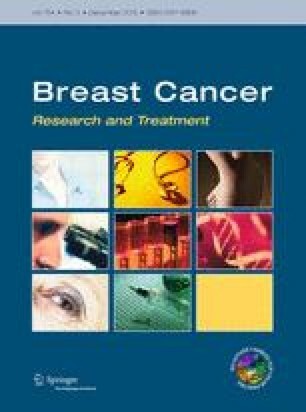 Nearly all patients (92 %) received comprehensive radiotherapy (RT) including axillary and supraclavicular fields. The Kaplan–Meier method and Cox regression analyses were used to analyze time-to-event outcomes. Median follow-up was 76 months, with a 5-year DFS of 64.9 % and OS of 71.9 % among the cohort. Poorly differentiated (p = 0.007), ER-negative tumors (p = 0.015) had adverse DFS outcomes. Treatment groups did not differ with regard to 10-year DFS (45.4 % for MRM vs. 57.6 % for BCT; p = 0.31), or OS (61.4 vs. 63.7 %; p = 0.79). DM-free survival was 48.9 % following MRM and 60.6 % following BCT (p = 0.19). Patients with ≥10 involved LNs have similar outcomes following BCT or MRM, suggesting that RT may obviate the need for more-extensive surgery. While local control is comparably favorable regardless of surgical approach, systemic control remains a challenge in this population. Lior Z. Braunstein and Sigolene Galland-Girodet have contributed equally to this work.